This pillow is nice, but it's not as squishy in terms of the older Temper-pedic pillows. I am still getting used to it. When you sleep on the side, your head does not sink down as much as the older memory foam version. The place in the middle sort of cradles your head and supports it. Overall, it's a nice pillow. 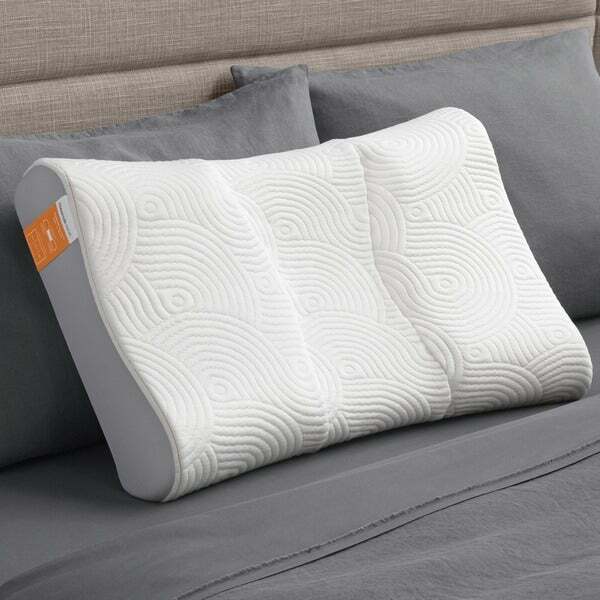 The TEMPUR Contour Side-to-Back pillow by Tempur-Pedic offers targeted support to keep you comfortable all night long whether on your side or your back. The supportive TEMPUR material and the ergonomic shape with the first-ever dual feel design offers even support as you move from side to back, and side again. The ergonomic curved design works with how you move during the night, the dual feel design offers firm TEMPUR material to support the neck and softer TEMPUR material to comfort the head. This pillow is Excellent! I had a Tempur-Pedic Symphony that I purchased about 8 years ago and it needed to be replaced. My neck and shoulder were aching after sleeping because I didn’t have any support. The first night with my new side by side and the pain is gone!!! Love it!!! I searched high and low for about three months and tried several pillows before deciding on this one and I have never looked back. This is a firm pillow and it stays pretty firm. I hate pillows that collapse under you and I have found no pillows that hold their own expect this one. I actually gave my husband my old one after three years as it had softened some and I was using the thicker side to compensate. We bought the traditional neck pillow for my husband originally and he fell in love with mine so the slightly broken in pillow was a nice way to ease him into how firm it is. I love this pillow. It helps keep me asleep on my back (which is my goal). It is firm, so if you like very firm pillows, this one is for you. I use a cpap machine and always sleep on my side or back. This pillow is very comfortable for sleeping in either position. Excellent quality and received it promptly. I bought this pillow and have slept on it for 2 nights. I love that I don’t wake up with a headache or neck pain. I have spent thousands on pillows over the years trying to find one that holds my neck straight so I don’t wake with neck pain. This is my pillow. I will buy a couple more in the near future. Thanks to Overstock. I think I own every style pillow Tempurpedic makes. This pillow works well and feels good, but it is not as comfortable or helpful as I anticipated since I am a side sleeper. Bought these hoping I could use them, did not work for me but my son loves them. Me and my children have been sleeping with this pillow for a few weeks now and we all love them. Heavy weight and nice spongey construction. I priced these out and this was the best deal I found. My husband broke his neck and has rods and screws. He cannot sleep with a pillow, but this has changed that. With the dip on the sides and in the middle for his head it has allowed him to get a more comfortable experience. I would recommend. This is my favorite pillow now. I am a side sleeper. I used to put a hand under my face. I don't feel the need to do that anymore. "What is the measurement of the low side back sleep area, how low is it?" This pillow measures 4.75 inches high x 17 inches wide x 24.5 inches long. I have one and I love it. Now I’m buying one for my daughter and a extra for family. When I purchased a Temperpedic mattress 15 years ago a contour pillow came with it. I love it and I think it's time for a new one.